It is becoming a trend that merchants pack T-shirt or pants compressed into a paper tube packaging box, as this method has lots of advantages: space-saving, convenience for carrying and, without doubt, cool. 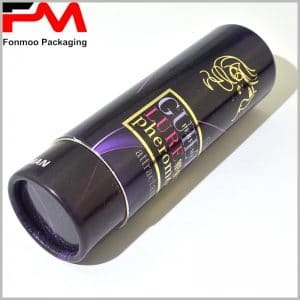 Here is a sample tube packaging box that is specially designed for this purpose. This black tube paper box, made of 350g grey cardboard and 80g black chrome paper, is robust, simple, modern and convenient. It can be used to pack trousers, pants, cloths or jeans, only with some proper customizations. The printing is simple but with good quality, it applies at the same time full-color printing with embossed effect to present attractive appearance. A light pattern on black background looks mysterious and seducing, and can boost the sale. Contact us if you want to get your commercial packaging based on this sample design. 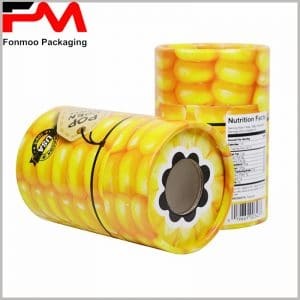 We offer almost all possibilities for tube packaging customization, with good price and condition, you will be satisfied with the pants black cardboard tube packaging box. Black tube packaging box to pack compressed T-shirt or pants, as a response to new trends. Made of 350g grey cardboard and 80g black chrome paper, this black tube paper box is robust, simple, modern and convenient, can be used to pack trousers, pants, cloths or jeans. It applies full-color printing with embossed effect to present attractive appearance.